Goddess Lakshmi is worshiped by people to attract wealth and abundance in their lives. She is worshipped during 'Festival of Lights' - Diwali. Some people do not lock their house lest they miss out the visit of Lakshmi to their house! 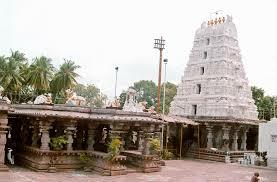 People in Hyderabad can visit the Ashtalakshmi Temple located on the outskirts of Hyderabad. The temple reflects South Indian Temple architecture and looks beautiful amidst other architectural monuments in this area which are mostly Islamic structures. This is one temple where you can witness Lakshmi in all her eight forms. In the mahagopuram of the temple, there are idols of many other gods and goddesses too - about 134 vigrahams or idols have been placed in the temple mahagopuram. Idols of goddesses Adilakshmi, Aishwaryalakshmi, Santanalakshmi, Dhanalakshmi, Dhanyalakshmi, Gajalakshmi, Vijayalakshmi and Varalakshmi have been installed inside the temple - all decorated with gold and other traditional necklaces. The temple gopuram has been carved intricately. There are minor shrines of Lord Narayana, Lord Ganapathi and Lord Garuda inside the chief gopuram. Another such Lakshmi temple is also situated in Chennai. The idol of Lord Srimannarayana is encircled by various other forms of Lakshmi namely - Goddess Santana Lakshmi, Gaja Lakshmi, Dhana Lakshmi, Dhaanya Lakshmi, Vijaya Lakshmi, Ishwarya Lakshmi and Veera Lakshmi. Lord Garuda is placed just opposite to Lord Srimannarayana. Sand and cement have been used for building the temple structure. The temple looks beautiful with lights illuminating the entire temple structure. The temple is not an ancient one and was built in April 1996 under management and administration of Kanchi Kamakoti Peetam. The Ashtalakshmi Temple has been built with an expenditure of INR 10 million and has taken collaborative effort in the form of donations from various sections of devotees. It took 5 years to complete the construction work of Ashtalakshmi Temple. Structure and design of the temple was conceived by Padmashri Padmashri S.M. Ganapati Sthapathi, and M. Mathiyalagan Sthapathi. The temple is located on a small hillock. You will have to climb a few steps before you reach the temple. 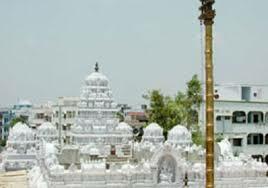 The temple is painted in white colour which looks elegant. The best time to visit Ashtalakshmi Temple is during Diwali and Varalaxmi Puja when devotees throng this temple in large number to offer prayers to goddess Lakshmi. Distance of Ashtalakshmi Temple from Nampall, Hyderabad: 12 kms. There is a Yagna Shala near the Temple and this is where 'havan' takes place everyday at this place. Every Friday, Abhisekam is performed to Goddess Mahalakshmi and Srimannarayana from 6.30 AM to 8.00 AM. This is one place where devotees come and ask for prosperity and happiness. Abhisekham: 6.30 AM to 8.00 AM. The temple remain closed during chandra grahanam (lunar eclipse) and surya grahanam (Solar eclipse). please tell me how can i reach ashtalakshmi temple near hyderabad? Hi! Hire an auto to reach the destination.